In 1993 my sisters moved my mother to an assisted-living center. Mom was in fairly good health, but taking care of her big house, lawn and shoveling snowy sidewalks was a bit much for her 69-year-old body. After weeks of research, my sisters found the perfect place, just a few miles from mom’s home. “The Point” was set up like a resort hotel, with a common dining area, many activity rooms, a gym, walking trails, etc. Great effort had been taken to ensure it didn’t *look* like a nursing home. The top floor was for fully functional retirees down-sizing from their present homes. The middle floor was for people needing occasional assistance, and the lower floor had hospital beds in apartments with full-time nursing care. People could move in, then obtain different levels of assistance as needed — without leaving the familiar setting of home and friends. They also allowed small pets, with pet-walking assistance available. My mother visited different places with my sisters, and liked this one best. However, despite *wanting* to move, she worried about the moving ordeal, and decided to wait another year. We knew she needed to move sooner, though, because she was experiencing ever more frequent asthma attacks requiring lengthier hospital stays. During one such hospital visit my sisters decided to act. I will be forever grateful to my two sisters, who saw my Mother’s need for enhanced safety and support in her life, and did what needed to be done. Moreover, they acted with incredible style and grace to help our mother through the difficult transition from independent to assisted living. While my mother recovered in the hospital, my sisters moved her living room, dining room, kitchen, and two bedrooms into a vacant apartment at The Point. They took photographs of every wall and piece of furniture so that after they reassembled her rooms in the new apartment, they could put everything on the walls and in the curio cabinets exactly how mother had it. Even the kitchen drawers and cupboards were put back as they were, with coupons, utensils, and a half-eaten bag of cookies on the counter. Coincidentally, this occurred days before my birthday. My mother had asked me to fly home for my birthday, and my reservations were made. I flew in anyway, assuring my mother that I would stay until she was well enough to leave the hospital. 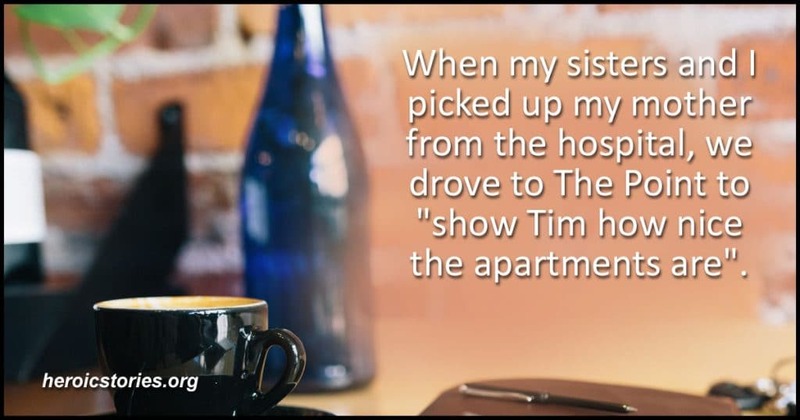 When my sisters and I picked up my mother from the hospital, we drove to The Point to “show Tim how nice the apartments are”. I hadn’t seen it, so this seemed reasonable. However, when we opened t he door to a supposedly vacant apartment, my mother found her *home* faithfully re-created inside. As she stood there slack-jawed taking in the moment, I habitually stepped into the kitchen and helped myself to some cookies and a glass of milk. All my mother could do was stand there, cry, and say, “Oh my! I’m home. I’m already home”. Well done, a nice touch. What a nice story. Taking care of aging parents can be tough. Kudos to your sisters for working together to make your mom’s home in a new location so welcoming. And kudos to your mom for her grace in accepting the gift and understanding this change was for her safety and well-being.